New Delhi: There is a good news on Monday for people waiting for the opening of the Kalkaji Mandir-Janakpuri West section on the Magenta Line of Delhi Metro Rail Corporation (DMRC). This section will be opened for the general public from May 29 next week. According to information received from DMRC, this section will be now inaugurated on 28th May instead of 24th May and the passengers will be able to take metro ride on this section on the next day i.e. 29th May, 2018. According to earlier information received from DMRC, the section was scheduled to open on 25th May for the general public and the inauguration date was scheduled on 24th May. The latest update said that this section will be inaugurated on 28th May and will be opened to the public on May 29 at 6 am onward. With the launch of this line, people of Noida (UP) and Gururgram-Faridabad (Haryana) along with Delhi will also be get beneficiated. Before this, the Commissioner of Metro Rail Safety (CMRS) had issued clearance certificates to start the metro train service on the 25.6 km long route between Kalkaji Mandir-Janakpuri West. In this section of the Magenta line (Kalkaji Mandir-Janakpuri West), there are 16 stations, including two interchange- Hauz khas (with Yellow Line) and Janakpuri West (with Blue Line) stations. There are total 25 stations on the entire Magenta Line (Botanical Garden – Janakpuri West, but at present the Metro service is started between Kalkaji Mandir and Botanical Garden (Noida). Once the service starts in the new section, the direct journey between the Botanical Garden and the Janakpuri West will begin. Travel time between West and South Delhi and Gurugram (Gurgaon), Faridabad and Noida will be reduced from Magenta Line. At the same time, Janakpuri West will have an interchange facility and the escalator located here will be the longest escalator ever in the country. The length of this escalator will be 15.6 meters, which will also break the record of the Mumbai Airport terminal 2, which is 11.6 meters long. 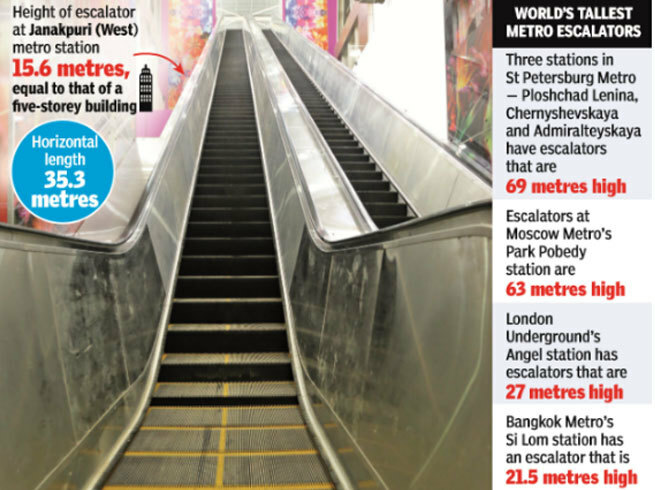 Now the length of this escalator at Delhi Metro station will be the highest in the country. The journey from Noida to the airport directly from May 29 will be completed in just 50 minutes instead of 2 hours. Passengers will get connectivity from South Delhi directly to Noida, the journey will be completed in just 19 minutes. Not only this, there will be direct connectivity to Western Delhi from South Delhi and there will be less than 1 lakh people with this road. With the commencement of operation on this corridor, there will be direct Metro service between IGI Airport (Domestic) from Noida and South Delhi. From Faridabad, it will be easier to reach the airport. Between Noida and Gururam, the convenience of the traffic will be improved. The metro is running between Kalkaji temple from Botanical Garden on 25 December 2017 on a distance of 12.64 kilometers of 38 kilometers long magenta line. On the 25.36 km, stretch between Janakpuri West-Kalkaji Mandir is going to start operational and now it has also opened its way. There are 16 stations on this corridor, including the Domestic Airport Metro Station. So the Botanical Garden will be delivered directly to Delhi Airport. Beside this, Faridabad’s people will be able to reach the airport by changing the metro train at Kalkaji Mandir Metro station. Hauz Khas will have a special metro station interchange station on Magenta Line. Currently, this Metro Station is available on Yellow Line (Samaypur Badli-Huda City Center). After starting metro services on the Magenta Line, people traveling from Noida to Gururgara can easily reach Huda city center by changing the train at Hauz Khas Metro Station. At present, passengers require to change the metro train from Botanical Garden to Rajiv Chowk, which takes longer time.